FRP Bypass Android Nougat 7.0 to 7.1.1 2017, Removing Factory Reset Protection aka FRP lock from android devices is being very handy for us. We have provided many easy and free of cost workarounds to bypass FRP from many Android devices time-to-time. 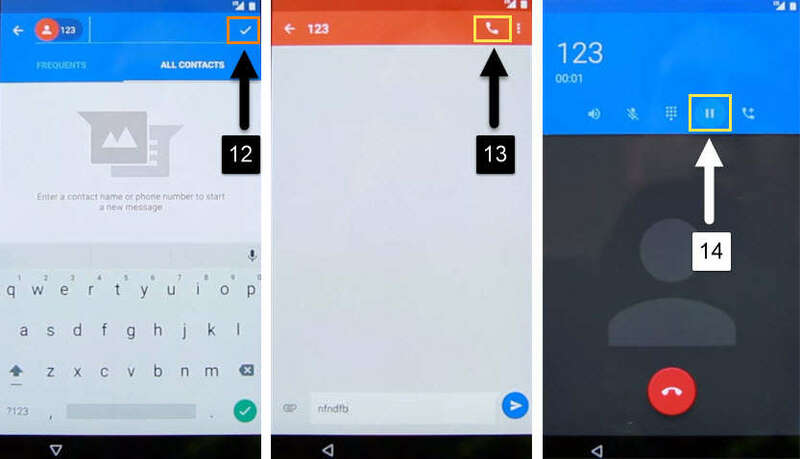 Android Lollipop 5 and Marshmallow 6 are way more easier when it comes to break the FRP lock. But when we talk about Android Nougat 7 or Android Oreo 8, things get difficult and more complicated. Why the previous FRP bypassing methods don’t work? With every new update from Android getting new security features and fixing the loopholes. That makes the device more secure as nobody wants their device to be stolen by someone with bypassed FRP lock. 1. You need a Bluetooth call receiver. 5. Software to “FRP bypass on Nougat 7.1.1 by GSM Flasher FRP”. Below are the messages which i received from many users about missing “Create Contact” option while applying the previous bypass FRP lock method. For Nougat there is no way to open “Contacts” while calling. Is there any workaround? Downgrading to Marshmallow is impossible. Thank you. on my Samsung S8+ (955U) there is no “Create Contact” during the call. Should I downgrade from Android 7.0 to 6.0 and try again? Also should I use combination files for down/upgrading firmware or they are just for locked devices? “Dear Admin, thanks a lot for detailed guide. However i have unique problem on device Samsung J510FN i have followed all steps successfully until call part. I have managed to establish call but problem is that i don’t have option on screen to save nr. to contacts. Actually only two options on post call screen are present “call” and ”video call”, everything else is white around and it doesn’t show any other option as it should be. Do you have any ideas/experience what is problem here and how to solve it? I have tried this and other methods with Odin and Sidesync, but none of them worked for me. Now, the major issue they are facing this missing option of “Create Contact” after ending the call. The main reason why they are facing this issue as these users are having the Android Nougat or Oreo in their devices. As I mentioned above, Android is fixing all the loopholes with their latest updates. Fortunately, we got a working guide for Android Nougat and Oreo users and we decided to post this on our website to help you out from this issue. After having all these recommend items for this FREE guide. 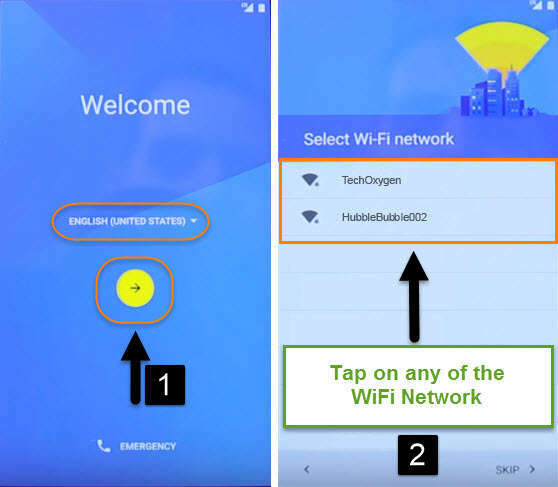 Follow the step-by-step tutorial to “bypass FRP from Android Nougat 7.0, 7.1, 7.1.1” from the video i posted above. 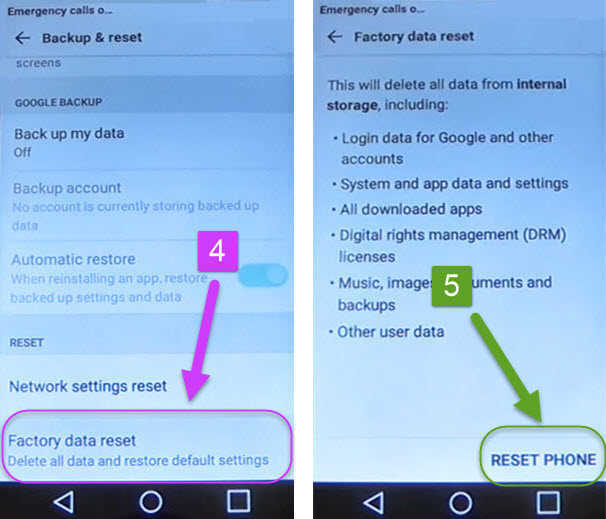 Using this guide will help you to completely remove and deactivate Factory Reset Protection inshort FRP from any android device. 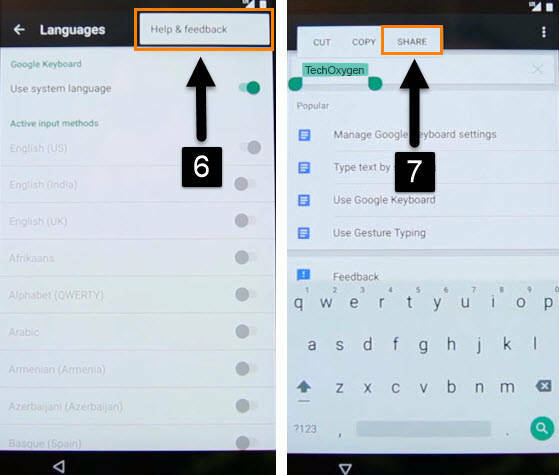 This specific method is made for “Android Nougat 7.0, 7.1, 7.1.1” devices. For Android lollipop 5.0, 5.0.1, 5.1.1 and Marshmallow 6.0, 6.1, 6.1.1 you can use the previous method which works perfectly for these android versions. On condition that you’re still facing any issues regarding this updated ‘method to bypass FRP from Android Nougat 7.x.x’. Feel free to comment below about the problem and we are here to help you out. 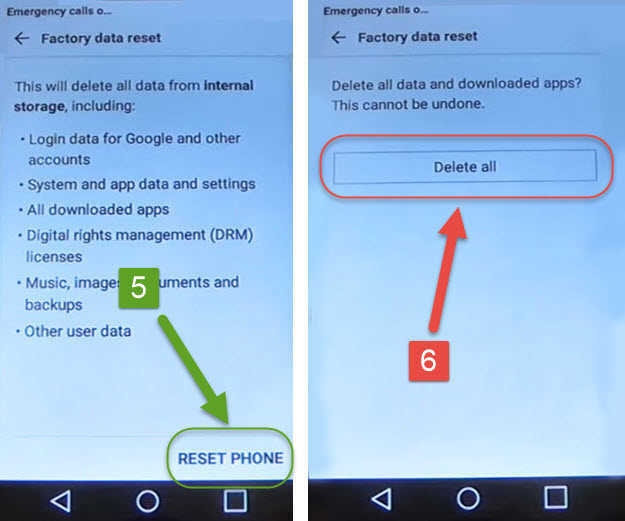 Today we have got another Factory Reset Protection complete step by step method for Huawei Nexus 6P, LG Nexus 5x, LG Nexus 5, Motorola Nexus 6 and other android devices. 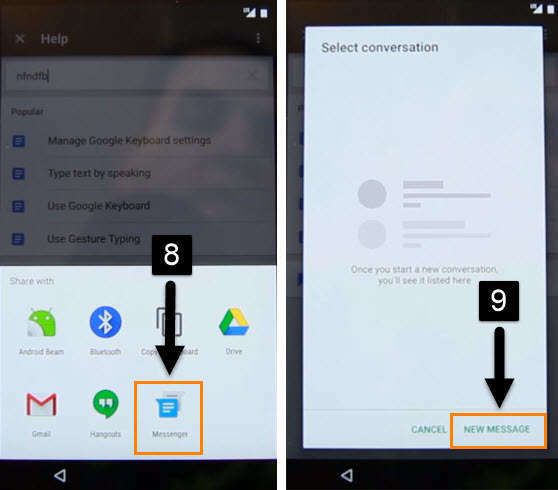 We are going to apply this method on Huawei Nexus 6P having Android Version 6.0 (Marshmallow) but this guide will also definitely work on LG Nexus 5x, LG Nexus 5, Motorola Nexus 6 “Also known as Motorola Nexus X, Motorola Moto X Pro (China)” and a lot of other Android devices. This method is universal for all Android Versions like “Lollipop 5.0-5.1.1, Marshmallow 6.0-6.1.1 and Nougat 7.0-7.1.1 (UPDATED)”. 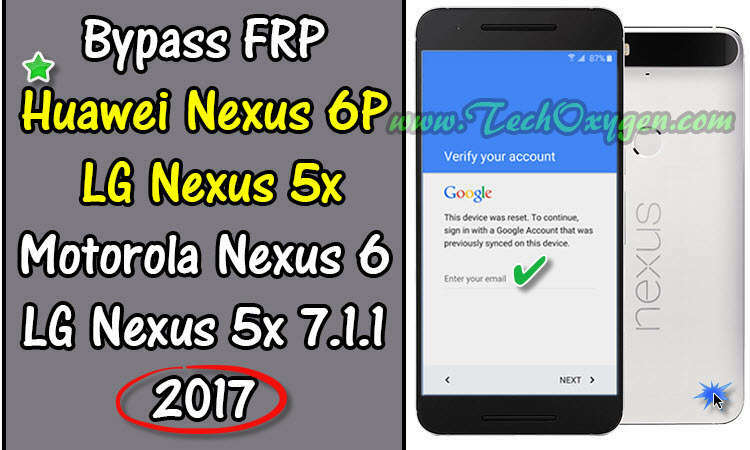 Nexus devices ain’t that hard to unlock FRP, there should be a good and authentic procedure. 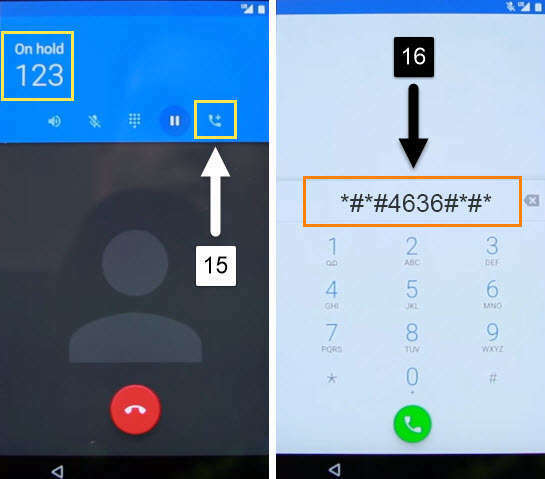 Fortunately we have made this method for people who are suffering from a LOCK FRP nexus device. 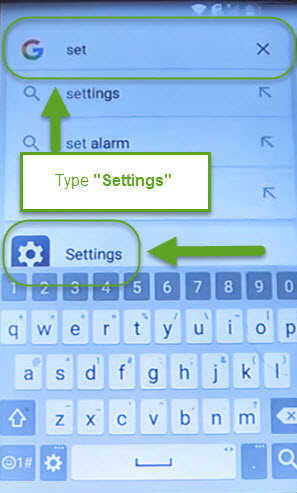 When the Keyboard appears, hold down the “,” comma button and tap on “Settings Gear” icon and then select Language. #2: Hit over “:” three points at the top right corner of the screen and select “Help and Feedback”. Now in the field type “TechOxygen” and select it by pressing a finger tip on it until “CUT COPY SHARE” options appears. After that select “SHARE” option. Type 123 > tap on Send to option > and then select “Group Icon” from the top right-hand side corner of the screen of your device. Select “Check” and then you’ll have access to the call button. Just hit the Call button and then hit the Pause button to pause the call. #4 Now select “Add Dialer” option from this screen and type this code: *#*#4636#*#* into the dialer. This will open up the Testing mode screen, select Usage statistics and hit back button it will lead you inside the Settings of your phone. RESET PHONE > and finally hit over ERASE EVERYTHING. Congrats, you’ve successfully bypassed factory reset protection. Once the phone restarts complete the initial setup and you won’t face FRP lock or Google Verification Screen anymore on your device. Instead it will ask you to “Add your account” enter the details of your own Gmail Account or you can also create a new account. 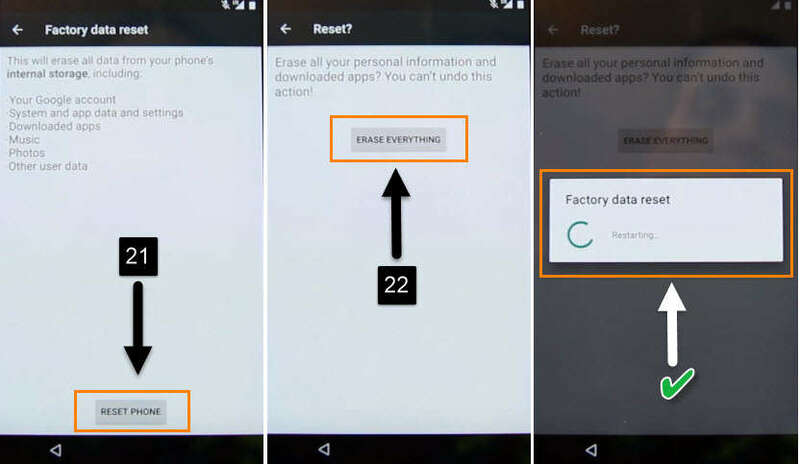 I hope you guys like this process to get pass the Factory Reset Protection (FRP LOCK) or Bypass Google account verifying screen on your ‘Huawei Nexus 6P, LG Nexus 5x, Nexus 5, Motorola Nexus 6’ or any other android device. We’ve also tested this on LG Nexus 5x 7.1.1 and the Motorola Nexus 6 and it works on both the devices and this guide should work on other devices too. 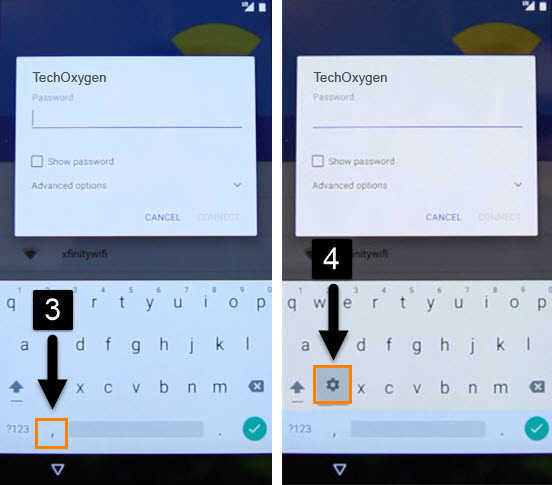 Basically any android device have a Google keyboard and the basic stock applications this guide will easily bypass Factory reset protection FRP from them. Bypass Google verification on LG using free and easy steps from this latest updated guide 2018. 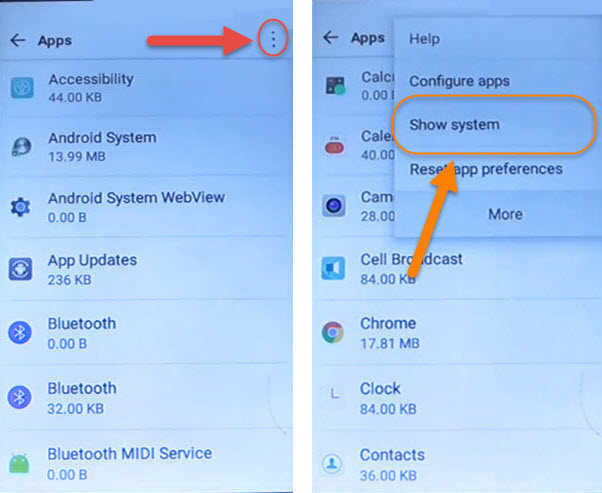 In the previous guide, unlock FRP and bypass Google account verification on LG we encountered issues with the HOME Button section which was the main section to remove FRP lock from LG devices. A lot of users posted comments and email us about this issue, they reported after pressing “Home Button” suddenly an error appears: Complete Setup to Continue and they can’t proceed to the next steps to unlock FRP (Factory Reset Protection) from LG smartphones. Fortunately, we are back with an other latest method to “Bypass Google verification on LG” in 2018. Which does not require users to go through the “Home Button” section, somehow we try to make it a bit easier and different as well from the previous guide. 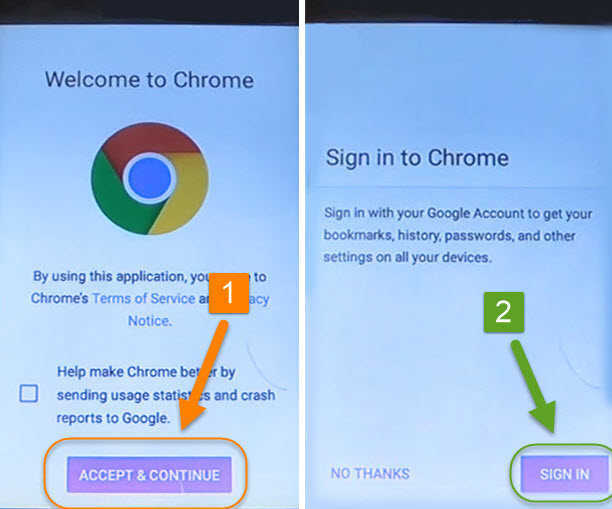 Most specially you won’t face Complete Setup to Continue error while applying these steps, we capture each step so that user can easily understand and apply bypass Google verification on LG for their LG android devices. 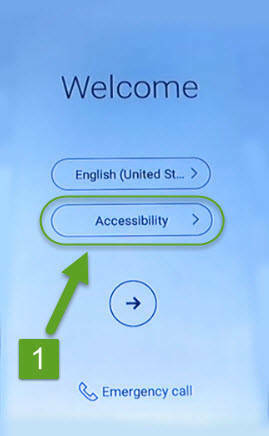 Select YES inside Accessibility tap over Vision. 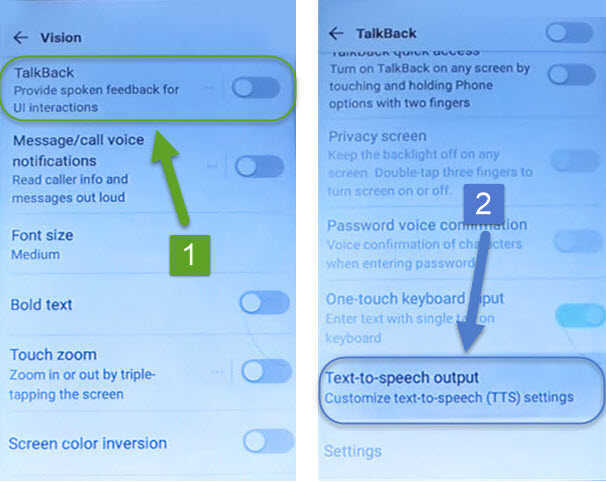 Select first option Talk Back then scroll down and select the last option Test-to-speech output. 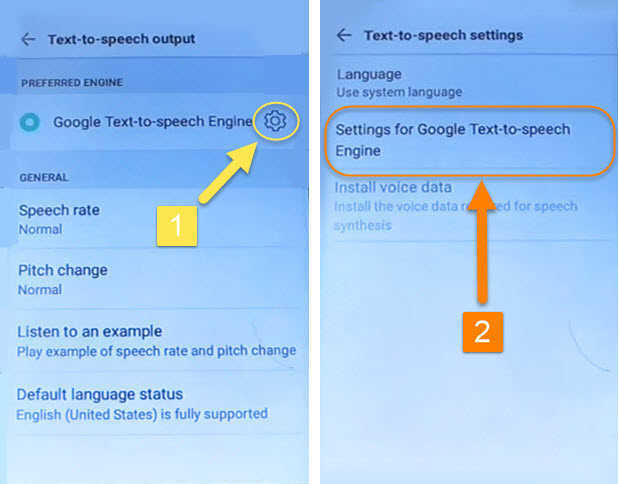 In this section, Tap on Settings Gear Icon and then select Settings for Google Text-to-speech Engine. Select Feedback and from this screen Push over Terms of Service hyperlink. 2 Step:After that Chrome Browser will pop-up select Accept and continue > and No Thanks. 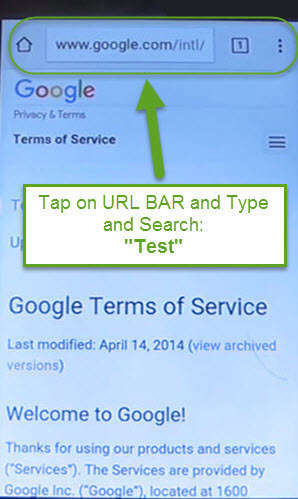 Hit over URL BAR and on the search bar type Anything and search. 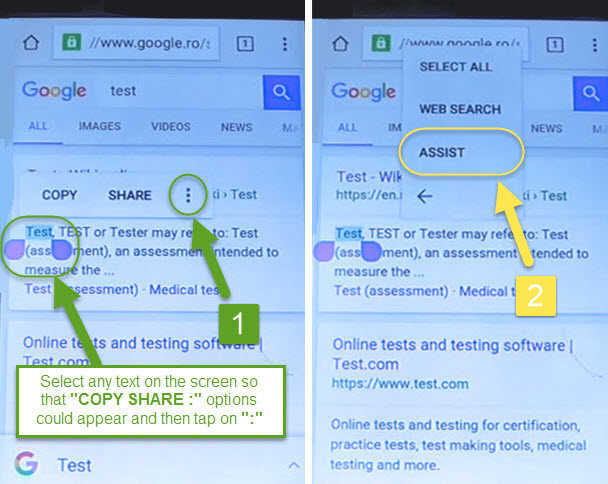 Here push long on any text to select on the screen until you see COPY SHARE : options. Tap on the “:” three points and then select ASSIST after that Google window will appear hit over No Thanks. Now type Settings on the search bar and select Settings Option. 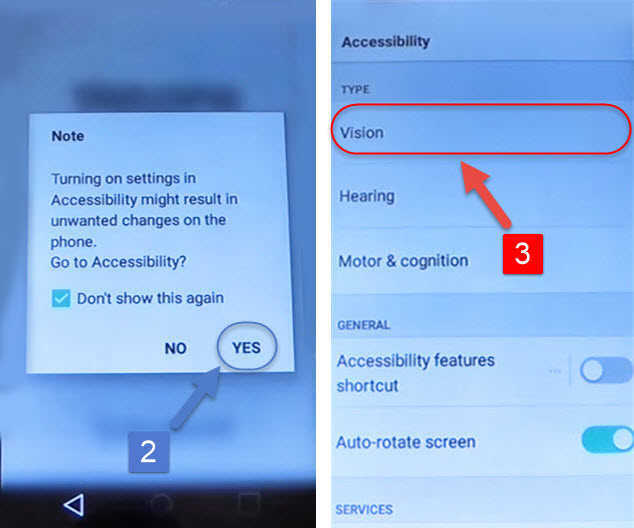 3 Step: Fortunately, now you have access to the Settings of your LG android phone with the help of “bypass Google verification on LG” method. Scroll down and go to Apps. Hit over the : three points from the top right hand side corner of the screen and select Show System. 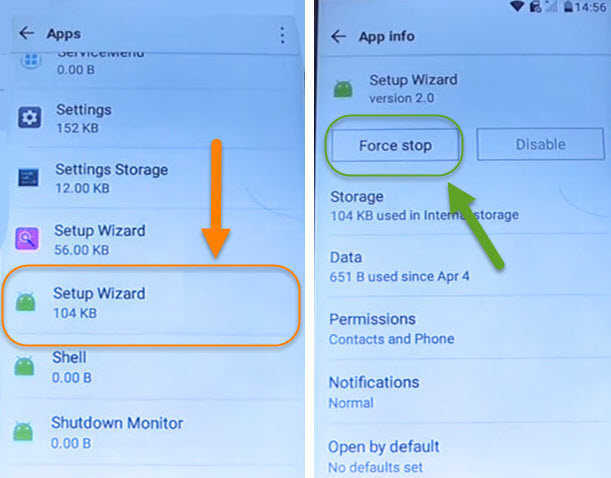 From this section, Scroll down and go to Setup Wizard (With Android Icon) and tap on Force STOP. 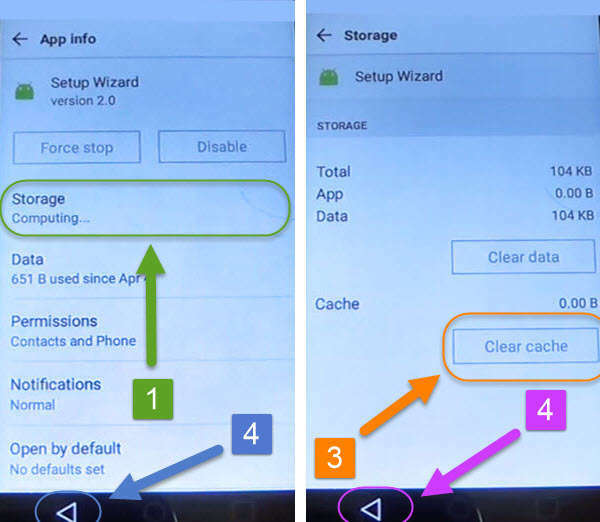 Inside Setup Wizard Tap over Storage and hit over Clear Cache and then hit < back button twice to go back to the Apps Section. 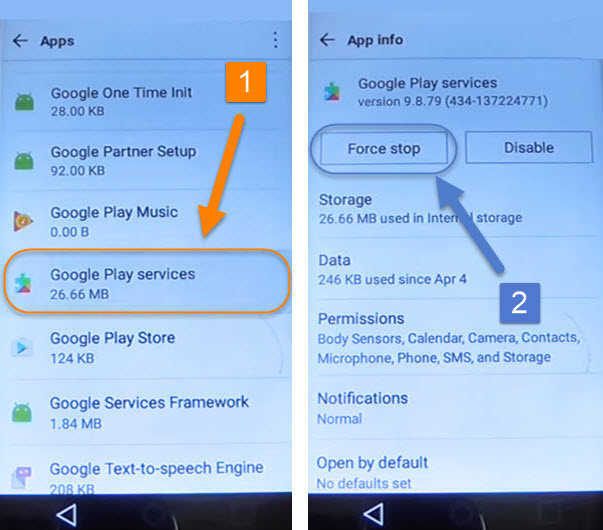 Once you in the Apps Section again, Scroll UP and select Google Play Services option and hit over Force Stop > OK and also tap on Disable. Last Step: Hit on Back button twice to go back to the Apps again, and then just press Power Button and Restart your LG Phone. 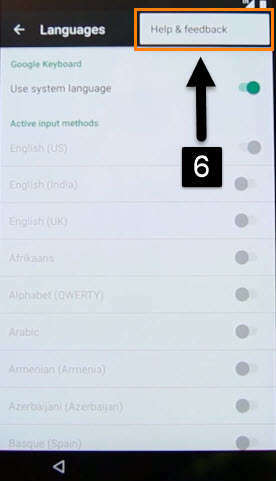 Once your phone restarts, Select the Home Language > (If you’re connected with WiFi-Network) Push it long and select Forget it. You can now complete the other initial setup and after getting into your phone. Don’t forget to Soft Reset it after unlocking the bypass Google verification on LG. Updated Method: How to Bypass Google Account or Unlock FRP on LG V10, LG G4, LG G3, LG G2 and Other LG Devices. It’s important to Soft Reset or (Factory Reset) device after removing the Factory Reset Protection or bypass Google verification on LG. Don’t worry, your LG android device will not get locked again with Google account verification lock. 2. 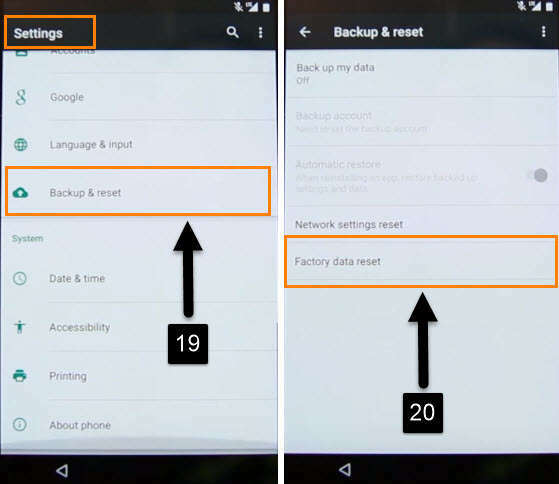 Scroll down and tap over Factory Data Reset and Reset Phone > Reset Phone > Delete All. Now just after your phone restart, Complete the initial setup and there will be no FRP Lock or Google Account Verifying page anymore. SEOUL— LG Display Co., one of the world’s biggest manufacturer of display screens used in smartphones and televisions. 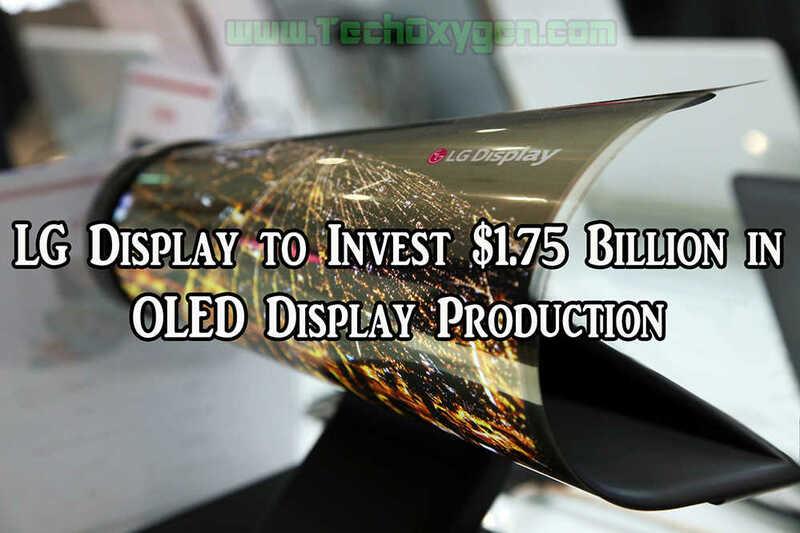 Said Wednesday it would invest 1.99 trillion Korean won ($1.75 billion) to produce flexible organic light-emitting diode, or OLED, displays for use in mobile phones. From the last many years, The demand for Curved display Smartphones is increasing day-by-day. And users really interested to use something different in technology. Fortunately, LG Display company is here to provide there costumers that experience. That’s why they have taken notice to that demand and the South Korean Company plans to invest $1.75 billion. (1.99 trillion won) to produce curved OLED displays. In the future many smartphone companies may adopt curved displays in their future devices. South Korean Company plans to begin a latest production line named “E6” that is planned to start mass manufacturing in late 2018. That will produce 15k (15,000) input sheets every month for 3 million handsets with a curved display of 5.7 inches. Back in the days, LG Display had already been making more larger OLED displays. Which were mainly used for television although its small-sized screens mainly made of LCDs. The company is of course a major supplier in the Display Industry, including Apple. This has been using the firms LCD displays in their iPhones. LG Display’s affiliated company LG Electronics is also sources LCD displays from LG Display for its smartphones. LG G5 which is the latest flagship of LG is also featuring IPS LCD display from LG Electronics. LG Display also happens to be the largest manufacturer of LCD displays at the time. Advantage of OLED curved displays over the typical LCD display as OLED technology will show the users more saturated colors, such as a darker black. Main advantage of OLED screen is it has more flexibility as it can be folded. and bend hence enabling smartphone manufacturers to bend it into a curved screen for their phones. OLED displays also made to use less battery and heat problems are also less common. With its latest investment, LG seems to be looking to catch up with its biggest competitor, Samsung Display. Which is currently focusing on the small-sized OLED screen market and shows no sign of slowing down or hanging problems. Samsung has already been using its OLED displays in many of its devices. Over the past years, from its flagship Galaxy smartphone series to its mid-range J series. Most recently, Samsung is using OLED curved displays in its Galaxy Edge series, with the latest being the Samsung Galaxy S7 Edge. Seeing how far ahead Samsung is in the OLED display business, LG has a long way to go to match Samsung. How do i get my phone off safe mode for Lg G4? How do i get safe mode off my phone LG G4? How do i get my LG G4 out of safe mode? 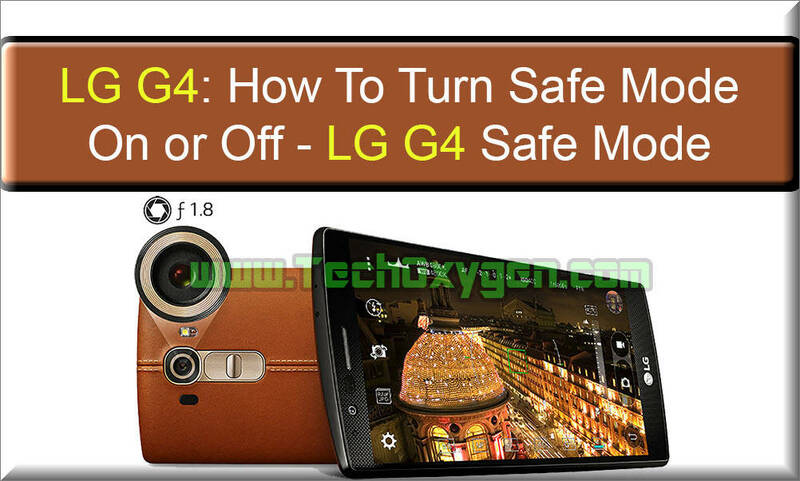 So, in this article we are gonna talk about LG G4 Safe Mode option. 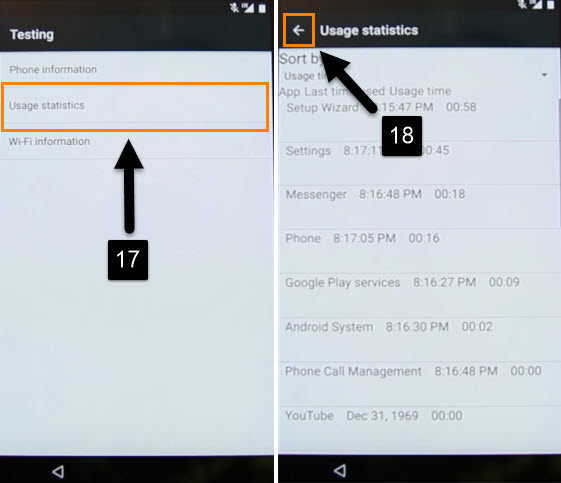 Lots of people think it’s not safe to run LG G4 cell phone in Safe Mode but there is nothing wrong in this. For some reasons. 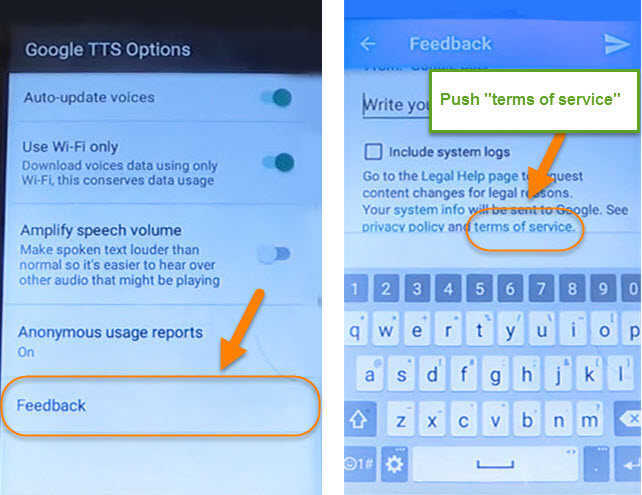 So, First talk about how to Get in to Safe Mode with LG G4 all you need to do just grab your G4 device and its must be turn-on to performing this method. Hold the Power Button of your device and the menu will appear on the screen for Power Off then just Hold Power Off option for a second and then it will give you the option to “Restart in Safe Mode” so simply tap on “Ok”. Now the phone will restart in Safe Mode, Which will be written down on the lower left hand side something like this “LG G4 Safe Mode“. Alright, So now you can do whatever you need to do with your cell phone because its working in Safe mode now. 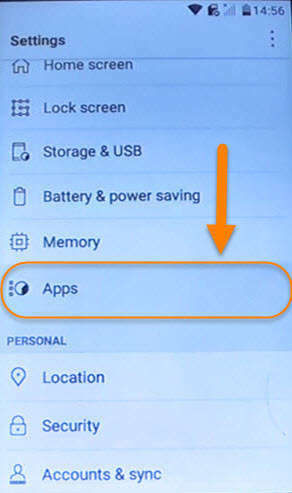 Next Step – How to get LG G4 phone out of safe mode or remove safe mode? How do i get out of safe mode? How to disable safe mode? Okay, now you are in Safe mode and you don’t know how to get out of it. Simply follow these simple steps to get out of safe mode. Again all you need to do is hold the power button and the same options will appear on your screen which appeared when you make your LG G4 in to the safe mode, now this time you’ve to select the second option which is “Select And Restart” and click OK.
Once it reboots its gonna reboot normally again, and the phone will be no longer in safe mode. 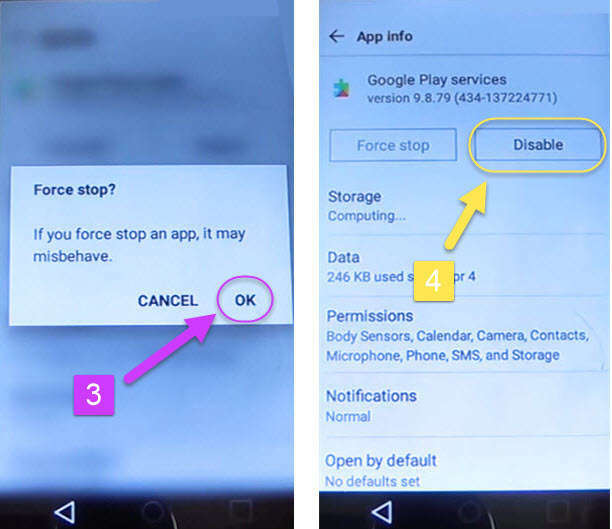 So that’s how you get your LG G4 into and out of safe mode easy and simple guide. Hope this guide help you out. 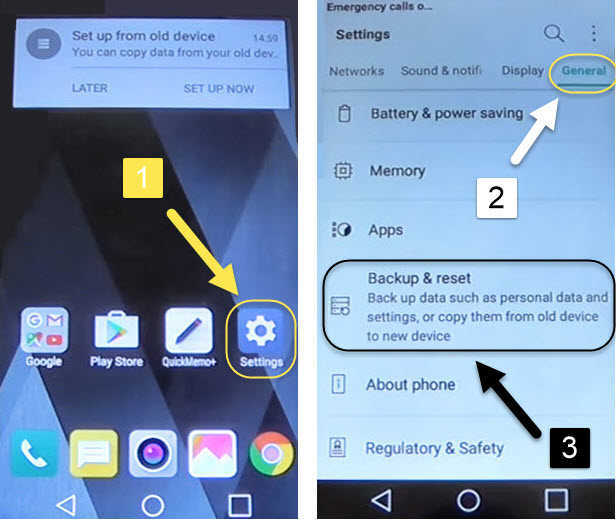 So now you know how to enter in to safe mode in LG G4, LG G4 Safe Mode guide. I hope this method for boot LG G4 in to safe mode helped you and now you’re not facing any problem with your phone. If you need any help you can comment below. This is the short and easy guide to know how to hard reset The LG L70 MS-323 Metro PCS T-Mobile step by step. This guide works perfectly for LG l70 MS 323 I heard about many articles online which doesn’t work properly with hard resetting LG L70, So finally I got a short and easy guide which actually works, Now hard resetting is putting the Phone back to its Factory state wiping it out completely. So, Its a very useful tool for looking to sell your phone, Just wanna erase and securely remove all your data of the Phone or you forgot the password and can’t turn on your phone. 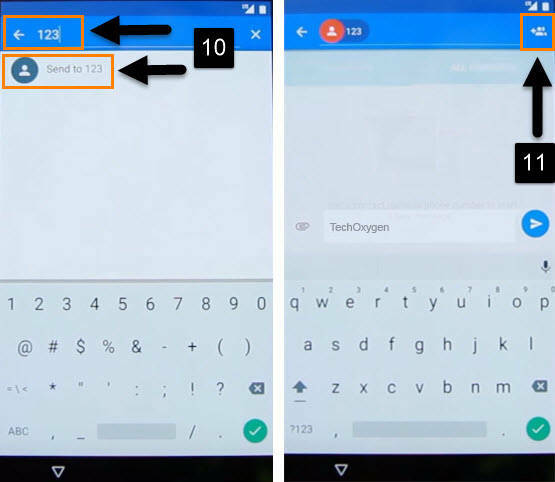 The first thing you gonna look for the “Up and Down KEY” to your phone which is bascially use for + Increase or – Decrease the volume in your smartphone and also look for the “POWER KEY” on the right hand side on your Phone. Press “Volume Down KEY + Power KEY” at the same time, now when the LG logo appears on the screen, remove your finger from the Power button and press it again instantly. Continue to hold for another five seconds. Then the “Factory Data Reset” menu will appear and it will ask you to “Erase all user data and restore default settings?” now press (Volume down key) to select “YES” and then press “Power button” to select, Now it starts the Factory Reset Processing. That’s it! simple is that, So many people were asking me about how to hard reset LG L70 MS-323 Metro PCS T-Mobile Now this process will work on any carrier based LG L70 another boost has a similar model called “LG realm” this is the Metro Version so this guide resetting or Factory Data reset LG L70 MS-323 Metro PCS T-Mobile works on both models. 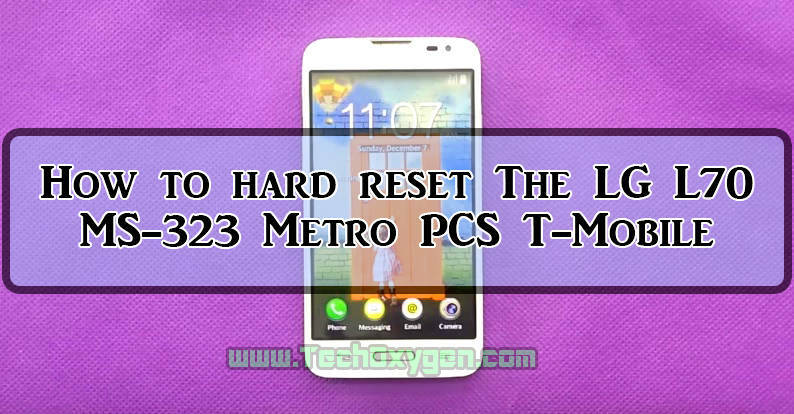 So, This is the complete guide for how to hard reset LG L70 MS-323 Metro PCS T-Mobile now we have completely reset our LG L70 MS 323 Cell Phone, If this article doesn’t work for you then let me know about any problem regarding your smartphone in the comment below.